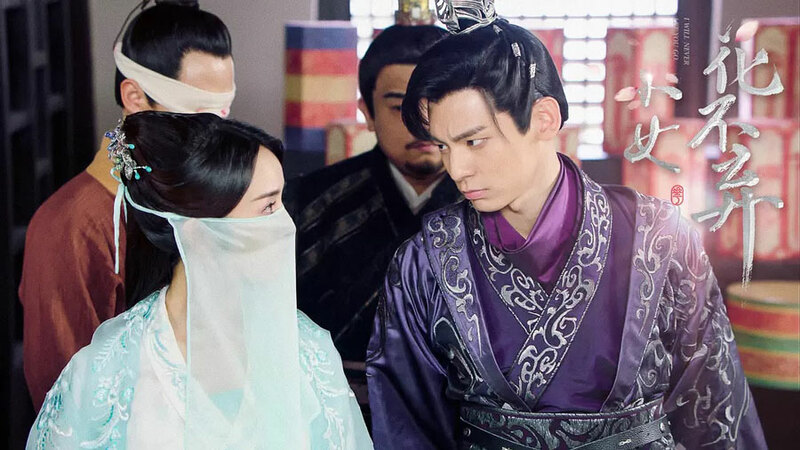 These are recaps of I Will Never Let You Go Chinese Drama Episodes 3-4, Hua Buqi buries Xiao Huang with tears, and decides to accomplish Jiu Shu’s last wish. She returns backyard and takes off Man in Black’s mask, but he kidnaps her and asks her to wrap up his wound. Note: From here on out there are specific plot spoilers for I Will Never Let You Go Chinese Drama Episodes 3-4. Hua Buqi takes the pot to flee, but the people of Ming Yue house chase her to the cliff. She wants to jump off with the pot, but Lian Yike saves her. Lian Yike cuts off Qing Wu’s clothes and sees the sign on her body. He knows the people was the robbers. Lian Yike has to take Hua Buqi to leave for protecting her, and flees to a cave. Hua Buqi wants to pick up Jiu Shu’s body, but Lian Yike tells her to stay there. He goes out to look for Jiu Shu’s body, but the people of Ming Yue house find Hua Buqi. She flees with her dog Xiao Huang, and decides to hide herself in Yao Ling house. The madam decides to keep Huo Buqi after hearing her origin. Qing Wu visits Yao Ling house, and asks Lin Mantang to report Lian Yike to police station. When Hua Buqi returns the cave, Lian Yike found Jiu Shu’s body and buried him. She cries out, and he asks her for her plan. Hua Buqi decides to ride Chen Yu’s carriage to capital, but she dislikes Chen Yu. Chen Yu returns hotel, and knows Hua Buqi is his sister. He thinks Yao Ling house united the robbers, but he wonders why Yao Ling house wants to be against Fei Yun fort. Hua Buqi dresses up to be a maid, and Lin Dansha recognizes Hua Buqi was the girl who badmouthed Chen Yu at the hotel. So Lin Dansha ridicules Hua Buqi, and Lin Mantang thinks Hua Buqi looks like Xue Fei. So he wants to report it to Ming Yue house. But his son thinks it’s a chance to get the prince’s favor. Lin Mantang asks Hua Buqi to enter the inner house, and sends his followers to watch her. But Hua Buqi thinks Lin Mantang wants to marry her, so she decides to run away. Lin Dansha visits Chen Yu, and tells him that Hua Buqi is in Yao Ling house. Lian Yike runs into another man in black in the Yao Ling house, and the man in black presses the switch. The people mistakes the man in black as Lian Yike, and go to arrest him. Hao Buqi flees with the maids, and sees Lian Yike saving the Man in Black. Men in Black flees to backyard and fights with Xiao Huang. The Lin families kill Xiao Huang when fighting with the man in black. Hua Buqi arrives and thinks the man in black killed Xiao Huang. She hates the man in black who passes out, but she doesn’t kill him. Hua Buqi buries Xiao Huang with tears, and decides to accomplish Jiu Shu’s last wish. She returns backyard and takes off Man in Black’s mask, but he kidnaps her and asks her to wrap up his wound. She pretends to promise it, but informs his whereabouts to people of Lin house. He breaks the door to run away, and is intention to get in the doghole. But Hua Buqi takes people to show up, Man in Black swears not to forgive Hua Buqi. Hua Buqi gets out of Lin House, and returns the broken house. She hears someone talks inside, and wrongs him to be assassin. Steward Lin gets into the house, and finds the wronged person is elder master of Mo family, Mo Ruofei. Mo Ruofei claims he is innocent, and decides to talk with her after knowing she comes from Yao Ling house. He follows her to the cave, and asks her to return Yao Ling house explaining for him. Hua Buqi knows Mo Ruofei is good at martial arts, so she has to give in. She returns Yao Ling house with him, and explains it to Lin Mantang. Qing Wu visits Lin house, and wants to arrest Lian Yike. Mo Ruofei knows Hua Buqi is the person he looks for, and is happy. Lin Mantang’s son hears Qing Wu wants to see Mo Ruofei, so he wants to take Hua Buqi to leave. But Mo Ruofei disagrees, so they have a fight. Qing Wu knows Mo Ruofei is the arrested Lian Yike, and reveals he is the elder master of Mo family. Lin Mantang tells Hua Buqi that she is prince’s daughter, and wishes her to stay at Lin house. He asks her to be his adopted daughter, and tells Lin Dansha to teach Hua Buqi protocol. Lin Dansha hears Hua Buqi’s identity, but she still dislikes her. Lin Mantang asks for Chen Yu about prince’s illegitimate daughter, but Chen Yu is furious and wants to kill her. Mo Ruofei and the attendant Jian Sheng treat Lin Mantang in the Sun and Moon restaurant, and ask him to find prince’s illegitimate daughter. Lin Mantang is intention to give Hua Buqi to Chen Yu, but he hates her. So Lin Mantang decides to give her to Mo Ruofei, and gets the benefits.